A larger show of prime cattle were slightly harder to sell but very much in line with the national trend. Limousin 209.5p, 189.5p Houghton House. British Blue 185.5p High Moat. Charolais 210.5p Hallburn, 189.5p (x2) Sceugh Dyke. Limousin 207.5p Hallburn, 206.5p Sceugh Dyke, 205.5p, 196.5p Barrow Ling, 195.5p, 194.5p Welton Farm. Angus 168.5p, 153.5p Low Hallburn. British Blue £1,402, £1,261 High Moat. Limousin £1,241, £1,205 Welton Farm, £1,169, £1,191 Barrow Ling, £1,073 Sceugh Dyke. Charolais £1,269, £1,220 Sceugh Dyke,£1,105 Hallburn, £1,070 Sceugh Dyke. Angus £1,036, £947 Low Hallburn. Black & White 121.5p, 107.5p Dormansteads, 96.5p Harelawhole. British Blue 111.5p Netherhill, 106.5p Peela Hill, 101.5p Netherhill. A larger entry of 123 spring lambs were forward. Many more could be sold to advantage, especially lighter weights. Top price of £96 per head for Suffolks from North Cowshaw and to 222p per kilo for Texels from Bellfield. Texel 222p, 219p, 218p Bellfield, 218p Hayclose, 208.9p Kimmeter Green. Suffolk 207p High Glen Triplock, 204.5p Kimmeter Green, 200p North Cowshaw. Suffolk £96 North Cowshaw, £90 High Glen Triplock and Kimmeter Green, £87 High Glen Triplock. Texel £94 Kimmeter Green, £89 Bellfield, £88 Kimmeter Green, £85 Hayclose. A larger show of 5,248 prime hoggs were forward to the usual ring of buyers. All classes of hoggs were sharper on the week, with a tremendous show of Cheviot and Continental fed hoggs forward. Leaner types harder to cash, although light weight hoggs remained extremely sought after. 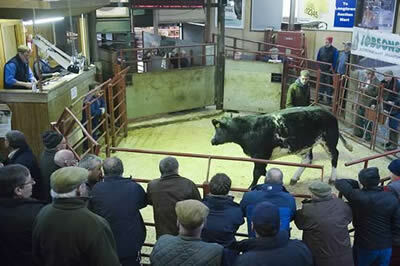 The sale averaged 180.7p overall (SQQ 188.8p). Top price per head was £100 per head for Texels from Mid Harrietsfield and to 237p per kilo for Beltex from Southernby Hall. Beltex 237p Southernby Hall, 212p Upper Auchenlay, 210p Burnbrae, 200p Sowerby Wood, 194p The Firs. Charollais 229p, 204p Upper Auchenlay, 195p Graystale, 186p The Nook. Hill Cheviot 228p Ringliggate, 211p Golden Lane, 208p Powheads, 207p Mid Harrietsfield, 206p Burnbrae, Clonrae and Braidlie. Texel 219p East Raffles, 218p Kirkbride, 208p Bombie, 207p East Raffles and Broomhills, 206p Kirkbride and Beechwood. Suffolk 206p Maidencots, 200p Haithwaite, 190.7p Dunjop, 189p Swaites and Graystale, 181p Broomhills. North Country Cheviot 202p Creca Hall, 200p Sowerby Wood, 199p Graystale, 197p Cleughbrae, 189p West Scales. Blackface 199p Roundbush and Hayclose, 197p Golden Lane, Clonrae and Whitefield, 194p Hallburn, 193p Haithwaite, 192p Southernby Hall and West Scales. Shetland 191p Newington and Golden Lane, 183p Mid Harrietsfield, 181p Golden Lane, 180p Dunjop. Greyface184p Stoneraise Place, 180p Routin Lynn, 176p Haithwaite and Newington, 170p Newtown and Maidencots, 169p Haithwaite and Clonrae. Swaledale 174p Stoneraise Place, 150p Newbiggin. Texel £100 Mid Harrietsfield, £99 Over Whitlaw, £97 Bombie, £96 Laws Hall, £96, £94.50 Braes of Enzie, £94 East Raffles and West Logan. Hill Cheviot £93 Bloan, £88 High Knells and West Logan, £87.50 Pennersaughs and West Scales, £87 Pennersaughs, High Knells, West Logan and Wicketthorn, £86.50 Wicketthorn. Suffolk £92 Graystale, £91.50 Barrockend, £90.50 Braes of Enzie, £90, £89 Graystale. Charollais £89 Moss Side, £86 Graystale, £81 Moss Side, £80 The Nook. 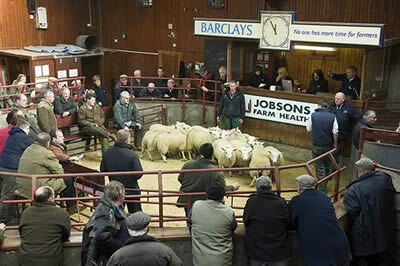 North Country Cheviot £88.50 Cleughbrae, £87.50 Graystale, £87 West Scales, £86.50 Netherplace, £86 Broomhills. Greyface£88 Newtown, £86 Braes of Enzie, £83 Clonrae and Stoneraise Place, £80 Graystale and Newtown. Blackface £87.50 Braes of Enzie, £85 Troloss, £83 Burnbrae, £77 Broomhills, £75 Clonrae, Broomhills and West Scales. Beltex£84 Burnbrae, £74 Sowerby Wood and Tercrosset, £70 Upper Auchenlay. Shetland £67 Golden Lane, £65 Newington. Swaledale £64.50 Stoneraise Place, £57 Newbiggin. A much smaller show of 2,048 cast ewes and rams were forward to a full ringside of buyers. All classes of ewes £10-£14 dearer on the week and well short of buyer requirements. Many more could be sold to advantage. Texel £150 Fineview, £148 Lairdlaugh, £144 Sibmister, £143 Chaseside, £140 Beckfoot. Charollais £147 Whitehill Cottage, £140 Demesne, £138 Beckfoot, £126 Chaseside, £124 Beckfoot. Beltex £140 Watch Hillside, £118 Whitehill Cottage, £116 Graceside, £114 Demesne, £102 Heatheglen. Suffolk £139 Heatherglen, £132 Golden Lane and Upper Mains, £127 Chaseside and Blackrigg, £126 Bidlake and Chaseside, £125 Beckfoot and Chaseside. Greyface£113 Bidlake, £112 Ringliggate, £108 Burnbrae, £105 Spoutbank, £104 Chaseside. Zwartbles £110 Whitehill Cottage, £100 Bogra. Leicester £110 Deadwater, £105 Achaurole Mains, £90 Ringliggate and Riggshield. North Country Cheviot £108 Earlside and Chaseside, £106 Heatherglen, £102 Achalone Croft, £100 Earlside and Graceside. Cheviot Mule £104 Kirkbride, £102 Backlass Croft, £96 Bombie and Routin Lynn. Lleyn£98, £77, £59 Farm Stock Genetics. Hill Cheviot £97 Greenburn, £81 Berry Croft, £78 Cambeckhill and Earlside, £72 Roughet Hill. Blackface £93 Gall Farm, £92 Crindledykes, £89 Braes of Enzie, £87 Greenburn, £84 Lawston. Swaledale £92 Riggshield, £90 Bellmount and Todhillwood, £84 Spoutbank, £78 Broomhouse. Kendal Rough £74 Gill Head. Suffolk £178, £162 Upper Mains, £160 High Glen Triplock, £148 Berryfell. Texel £158 Old Rectory, £154 High Glen Triplock, £153 Brocklerigg, £146 Braehillor, £142 Beckfoot. Charollais £145 Chaseside, £144 Heatherglen, £140 Bidlake. Lleyn£138, £128 Over Whitlaw, £89 Achaurole Mains. North Country Cheviot £123 Hawthornside. Easycare£88 South Port O Spittal.